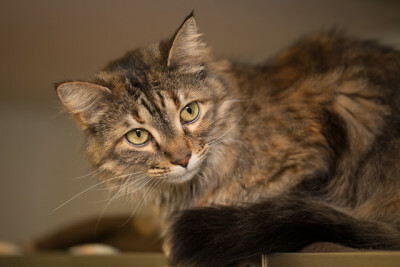 Mitzi is a brown tabby who had a big upset in her life last year. She lost her home when her elderly owner was no longer able to care for her. She was depressed and kept to herself when she first came to the shelter, but she’s been here for a little while now and has proven she’s a warm, affectionate cat. Mitzi is not really a lap cat, preferring to be near, but not on, her loved ones. But oh, when she’s ready for a petting session, she’s a purring machine, making her love and appreciation for those that understand her very clear! 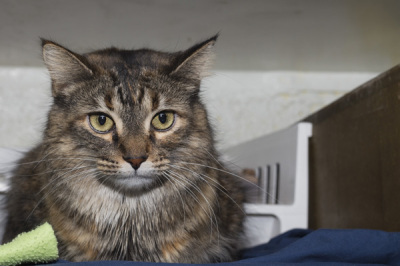 She does not approve of other cats, and because of that and her handling preferences, we are asking that she not be adopted into a home with other cats or children under 10 years. If you are that special person who wants a loving companion cat, but not one constantly on your lap, Mitzi might just be the cat for you! 2016-08-10: Pretty Mitzi has a new home! She now should feel safe to roam around on her own, and get to know her new family. What a lucky girl!